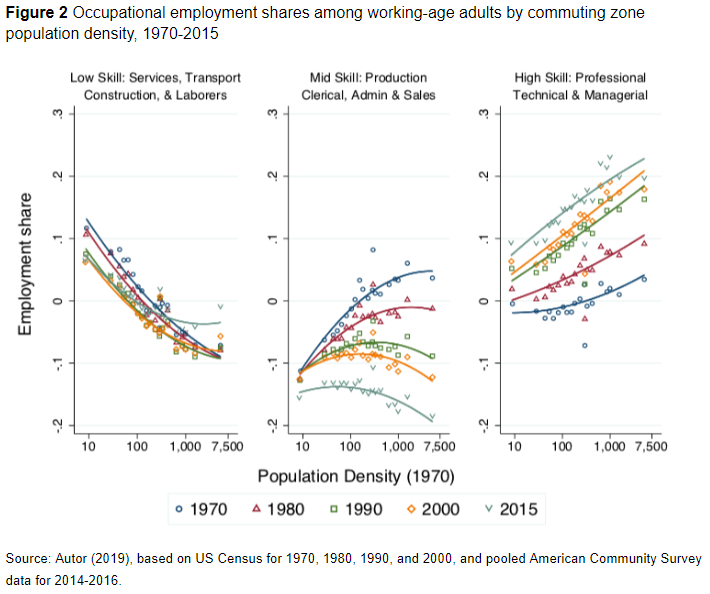 “Figure 2 depicts the aggregate relationship between population density and occupational structure at the level of 722 commuting zones (CZs) covering the contiguous US states between 1970 and 2015. The three panels of this figure report the CZ-level share of employment among working-age adults into the three broad occupational categories described above: traditionally low-education, low-wage services, transportation, labourer, and construction workers; traditionally mid-education, middle-wage occupations made up of clerical, administrative support, sales, and production workers; and high-education, high-wage, professional, technical, and managerial workers. The horizontal axis is the natural log of population density (the number of residents divided by CZ land area). For consistency, I used each zone’s population density in 1970 throughout, and the data are weighted by the count of working-age adults in each CZ. Each plotted point in the bin-scatter represents approximately 5% of all workers in each year.